The following is a re-post from an article by Ms. Chit Juan, Social Enterpreneur & Sustainability advocate Managing Partner of Echo Store (see our related blog on green products & gift ideas), one of SSTDI-The Coron Initiative Resource Experts. MANILA, Philippines – I remember Boracay in the early 1990s when it was lights out at 9 p.m., and you needed flashlights if you wanted to stroll along the shore after sunset, and resorts had ceiling fans and no air conditioning. Coron reminds me of such a time. And how I wish it would remain this way for a long time. For daytrippers, you can dock your banca at Smith Beach where the boatmen from Al Linsangan’s cooperative will cook up a quick healthy lunch of grilled squid and local fish, and some pork too if you wish. The boatmen come to the beach complete with reusable plates and utensils so as not to litter the beach with disposable plastic utensils. And they encourage you to take as many pictures as you wish while they fix lunch. After lunch, you board the boat to view Kayangan Lake, a steep 70-step climb in the forest where you are gifted with beautiful postcard views of the lakes of Coron. The island has many nooks and crannies, and snorkel spots like Twin Peaks, Siete Pecados, which responsible eco guides can lead you to. Beware that there are many tricycle drivers and boatmen posing as guides. There are about 40 licensed guides in Coron, and it would be more responsible to pay the proper fees for a proper guide. I wish that the local government is able to control the number of huts situated in the lake. The lake is actually best left to be managed by its original inhabitants, the Tagbanua, because they know how to preserve their environs. You could also go by paddle boat (I do not know how long it would take to paddle from Coron town to the island though) so as not to disturb the animals that have the island as their natural habitat. Visitors should also not use insect repellents, lotions and other chemical products that could leech into the pristine waters, which are so clear you would surely be tempted to jump in. To keep Coron as virgin as possible, a group of eco advocates have joined together to form the movement called The Coron Initiative. The movement seeks to teach tour guides to be eco guides, to teach resort owners how to buy green and serve green products, to teach boatmen how to preserve nature and to rally everyone to help save Coron from becoming another commercial destination. A day trip may not be enough to see Coron island as it has many beaches and snorkel sites. A few more days are needed, too, to explore the rest of the Calamianes Islands – Culion, Linapacan, Coron and Busuanga – and that is just for a quickie view. Even Coron natives still have not explored all their neighboring isles. What is important is to be a responsible tourist if we are to keep Coron and the rest of the islands pure and green. When we go on these trips, we should not expect city life and comfort. Rather, we should live as the natives do. We should all help in maintaining the peace and quiet of these islands. And of course, help in keeping it green and unadulterated. Al Linsangan III is the community leader and head of Calamianes Culture Conservation Network Inc. He also operates responsible and eco-friendly green tours. Hilbert Enriquez is a locavore and restaurant owner who infuses local flavor in his cuisine at Santino’s Grill. Ivan Fernandez operates eco-friendly Coron Village Lodge and has adopted green ways like using used cooking oil for their candles, retrofitting their lodges with eco-friendly materials, etc. Rene Villegas shares his knowledge about Biology with the eco tour guides, promotes closed season fishing which is three days before and after the New Moon so we can save our favorite fish made into the famous lamayo danggit. Eric Raymundo has volunteered his personal time to teach resort owners how to be energy efficient at the lowest price possible. Caloy Libosada teaches tour guides how to be eco-friendly and how to appreciate birds and birdwatching as a tour possibility. Chin Fernandez, another birdwatcher and Darayonan Lodge operator, promotes birdwatching tours. PJ Aranador shares with resort developers how to be more efficient in using native materials while keeping the Tagbanua culture in their designs, rather than taking inspiration from Bali or other cultures. Susan Santos de Cardenas is the moving force behind Sustainable Tourism initiative and has helped CCCNI find partners in the international community despite her being Japan-based. And the chieftain himself of the Tagbanuas, Rodolfo, who joined our conference (The Green Leaders Forum last July 1 and 2, see related story) to get everyone on the same page while guiding The Coron Initiative members in respecting the ways and customs of the indigenous tribe. There are many more advocates who can help preserve Coron and its sister islands and many more who can join the movement even while being a tourist or an investor. There are 688 more islands available for sale or investment and we wish developers would toe the line in keeping virgin islands like Coron the way they were when we found them. Let’s make it not just more fun in the Philippines, but greener too. 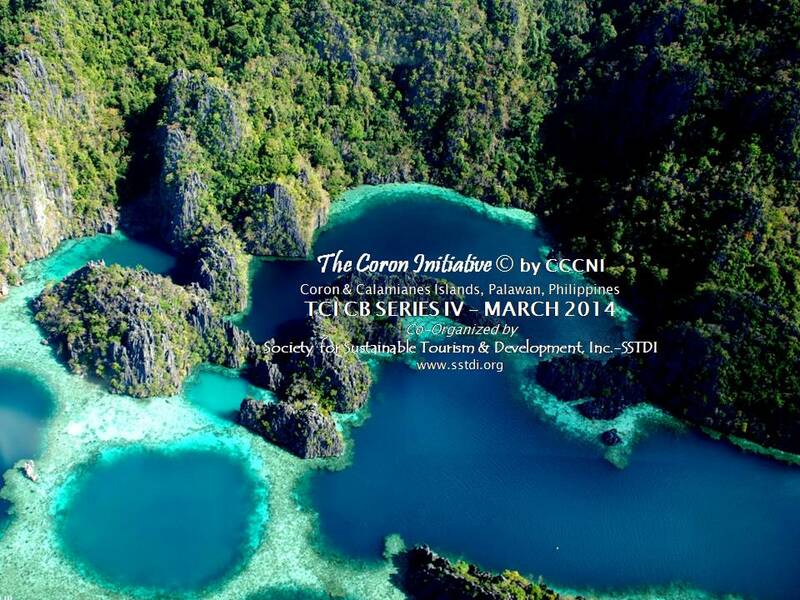 Take a green trip to Coron, Palawan, Philippines, site of The Coron Initiative– a UNEP APFED showcase program on Sustainable Tourism Development & Stewardship, the Philippines’ first sustainable tourism program. For more information and travel assistance please visit our Green Travel Exchange or contact us. Posted on December 17, 2013, in Ecotourism, Green Travel Exchange, Sustainable Tourism and tagged biosphere reserves, Coron, green hotels, green travel, Palawan, Philippines, Sustainable Tourism, UNEP. Bookmark the permalink. 1 Comment.